Irish on the Move argues that nineteenth-century variety theatre formed a crucial battleground for anxieties about mobility, immigration, and ethnic community in the United States. Transformations in mobility captured the popular imagination and offered theatre-makers a way to appeal to the fears and fantasies that accompanied the rapid economic and social changes sweeping through the country. Variety theatre produced what I am calling “dramaturgies of mobility,” or repeated narratives, types, images, strategies, and performative practices, that transformed shifts in mobility into systems of meaning to be received, resisted, and reformed. I suggest that these dramaturgies offer a lens through which to examine how performance participated in systems of meaning pertaining to mobility. These meanings produced systematic oppression as well as strategies for survival for immigrant, ethnic, and racial groups. In my case studies, dramaturgies of mobility reinforced and challenged anti-Irish prejudices against mobile workers and the wandering poor. They also served as constructive strategies for the development of ethnic networks. With a predominantly working-class audience comprised of large numbers of Irish and Irish Americans, variety theatre provides a unique opportunity to examine these emerging dramaturgies in dialogue with the shifting tastes, desires, and concerns of its working-class audiences. Popular Entertainment Studies 9, no. 1-2 (2018): 44-63. This essay examines the “tramp” on the variety stage at the moment of its cultural invention. In the wake of the Panic of 1873, the dominant imagination first invented the specter of the tramp as the nation debated how to deal with the new masses of mobile unemployed. For the earliest comic tramps in the 1870s, Irish and blackface comedy created a visual vocabulary that offered a quickly recognizable stand-in for the seemingly invisible crime of unemployment. As the decade progressed, performers portrayed the most popular comic tramps as Irish, aligning mobility with whiteness and turning the comic tramp into a performance of racial privilege. The Irish-American tramp may have reflected many of the negative characteristics of the tramp, including his wandering nature, his unemployment, and his drinking, but he also showed that the Irish-American comic tramp could be part of a community and in some instances, even a hero. 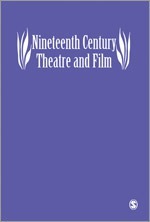 Nineteenth Century Theatre and Film 41, no. 2 (Winter 2014): 76-101. The proliferation of popular touring companies in the late nineteenth century provides an opportunity to explore how popular ideas of Irishness travelled and transformed across national borders. Through its international reach and unique form, the hibernicon --an Irish variation on the moving panorama-- had the potential to create an imagined collectivity among Irish emigrants and their descendants in the US and Australia. The hibernicon highlights the crucial role popular entertainment played in conversations about cultural memory and demonstrates the importance of transnationalism in cultural memory’s formation. Theatre Survey 55, no. 1 (January 2014): 48-80. In 1874, a group of newsboys took on some of the wealthiest, most respected, and most powerful New Yorkers and emerged victorious. The victory of the Grand Duke Theatre over the Society for the Reformation of Juvenile Delinquents may seem like a minor moment in American theatre history. It did not change the theatre licensing law or the society’s dislike of performance. Yet, exploring the puzzling circumstances surrounding the newsboys’ victory offers theatre historians an opportunity to understand basic elements of the culture of working-class youth and its relation- ship to the theatre. New England Theatre Journal 21 (2010): 1-23. In the plays "Essex Junto" (1802) and "Jefferson and Liberty" (1801), Jon H. Nichols' portrayal of Federalist leader Alexander Hamilton as a stage Creole reinforced and added to the Democratic-Republican image of Hamilton in the American mind. He altered the stage Creole stereotype to make it more imposing and immediately threatening to the American people as well as utilized the ambiguous racial implications of the stage Creole to encourage his readers to remain vigilant in the defense of the Republican nation and the Democratic-Republican Party. Theatre Topics 19, no. 1 (March 2009): 103-8. A TA acts as a vital bridge among the instructor, course material, and the students. It is this middle position that can become uncomfortable to occupy when a professor delivers a lecture on sensitive subjects, relating to race or gender, and leaves it to her TA to discuss them in-depth. This essay, based primarily on our experiences working as TAs for large lectures—classes with enrollments between 60 and 250 students at both public and private universities—explores the teaching assistant’s role in relation to the difficulties of leading discussion sections on antebellum African American theatre and performance, specifically minstrelsy. The Journal of American Drama and Theatre 19, no. 3 (Fall 2007): 51-77. A local and nuanced reading of the late-nineteenth century stage Irishman – especially as represented by the popular duo Harrigan and Hart – shows how the Irish-American community learned to adapt its identity to the demands of a diasporic culture as well as to the cosmopolitan and often hostile environment of nineteenth-century New York. Harrigan and Hart’s songs reflect not only knowledge of local New York Irish life, but also a fluid form that smoothly integrated other outside influences. The resultant hybrid ‘stage Irishness’ might have appeared similar to its stage Irish ancestors, but it was in fact much more complex and multi-faceted. Through their repeated performance, the songs synthesized Irish and New York influences into a composite Irish-American character. “Theatrical Boston, 1880-1930,” in Atlas of Boston History: The Making of a City, ed. Nancy S. Seasholes, forthcoming Fall 2019. “Performing the Northern Athens: Dr. Corry’s Diorama of Ireland and the Belfast Riot of 1864,” Forthcoming in Theatre Survey. Commissioned Review for the Special Section on Performance Studies and Early America. Performing Anti-Slavery: Activist Women on Antebellum Stages by Gay Gibson Cima. In Early American Literature 51, no. 1 (2016): 179-184. BlackPast.org is dedicated to providing information to the general public on African American history in the United States and on the history of the more than one billion people of African ancestry around the world. Dr. Quintard Taylor, the Scott and Dorothy Bullitt Professor of American History at the University of Washington, founded the site and serves as the encyclopedia’s editor. “Black Swan Records.” BlackPast.org. 2010. “The Ink Spots.” BlackPast.org. 2010. “McQueen, Thelma (Butterfly).” BlackPast.org. 2010. “The Mills Brothers.” BlackPast.org. 2010. “Anderson, Caroline Still Wiley.” BlackPast.org. 2009. “Patton, Georgia E. L.” BlackPast.org. 2009.